After leaving Meknes, we headed on our way via a short train journey to the city of Fes- our 5th city of this whirlwind adventure through the Kingdom of Morocco! 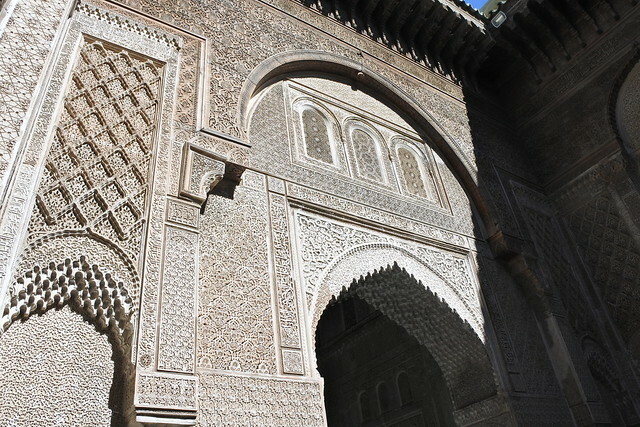 Fes is one of the four imperial cities in Morocco, and was truly incredible to visit. Perhaps most interestingly, Fes is known as one of the last hold-outs for true Moroccan handicraft, as the government has arranged for handicraft workers in Fes to be compensated well in order to preserve Moroccan artistic and cultural traditions. 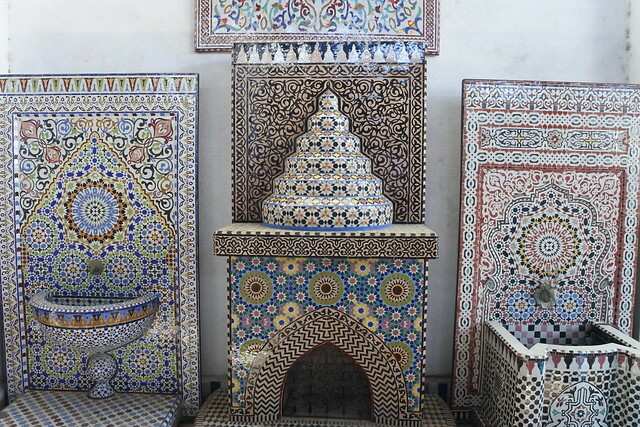 Since Fes has such a reputation for creating beautiful Moroccan art, we spent the large majority of our time in this city visiting the local artists (read: shopping) and wandering through the old medina. 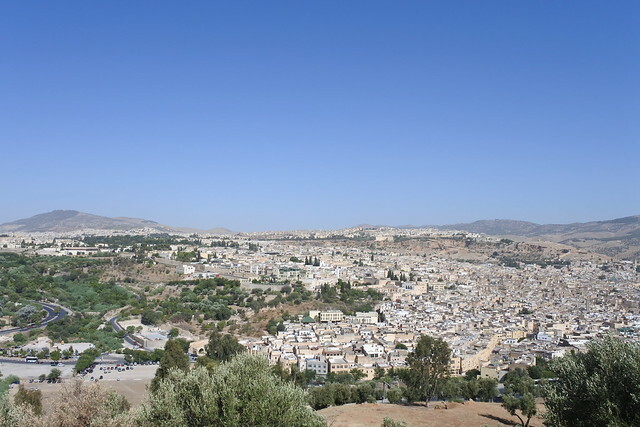 There is a great viewpoint of Fes that shows the true expanse of the medina’s intricate network of buildings, and makes you thankful for bringing along a local guide. Our guide was amazing, and she was able to successfully show us all of the interesting things to see within the medina, all while preventing anyone from getting lost in the tiny alleys and streets of the souk (market). 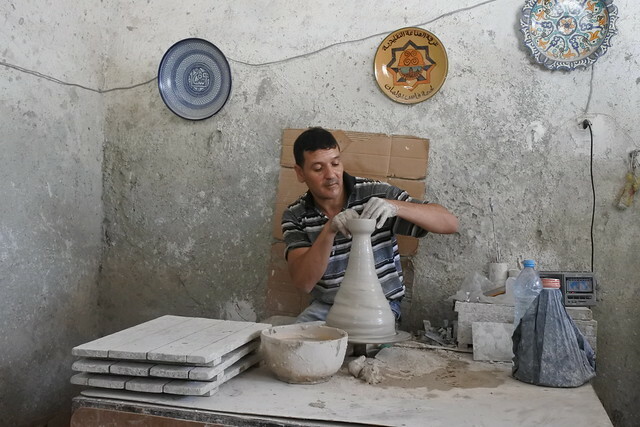 Most significantly, we visited the local mosaic and ceramic co-op where many of Morocco’s beautiful clay tiles, glasses, tajines, vases, and fountains are created. We first wandering around the studio spaces of the co-op to learn about the role of each artist, and how these incredibly intricate pieces are created by hand. Fortunately, you can have the co-op send any products you purchase back to your home via insured DHL or FedEx post, so you can go hog-wild with all of the beautiful ceramics and mosaics on offer! Fountain anyone? 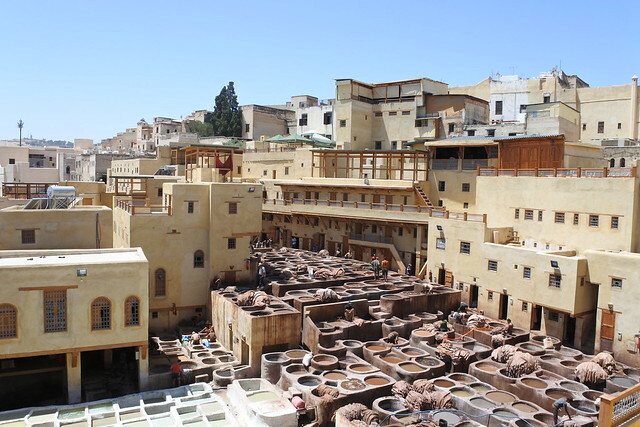 We also visited the Fes tannery, which is now listed as a UNESCO World Heritage Site. A visit to the tannery involves a hike up about 4 flights of stairs until you reach the roof of the building. From there, you have a killer view of the leather dying processes of the tannery, including the smell associated. I think the smell has something to do with the pigeon excrement that they use in the dying process, but it’s just a wild guess! The process is a centuries-old tradition that is certain to remain the same now that the site is protected by UNESCO. Despite the smell, it’s an interesting place to visit, and an even better place to shop! You’ll be able to find any leather good you could possibly want in the showroom once you’ve learned about how the products are made down below. 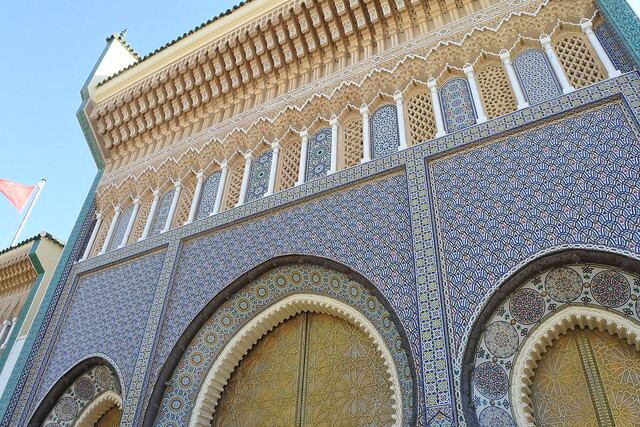 One of the most impressive places that we visited was the Fes Royal Palace. You might think this means that we got to have a stroll through the palace, or at least the palace grounds, but it’s not actually possible because members of the royal family still inhabit or utilize all of the royal palaces in Morocco. The impressive bit that we did see- the door- was enough for me to imagine what might lay beyond. Our wander through the souk of Fes’ old medina was an incredible look into the intricate details of a Moroccan market, visited daily by local families looking to pick up fresh ingredients for the day’s meals. Be careful, though, it’s incredibly easy to get lost in this medina, as it seems to go on forever and the streets wind in every way imaginable making the task of re-tracing your steps nearly impossible. The Fes medina is certainly worth a visit, as it holds many architectural and cultural treasures that wouldn’t be seen otherwise! For instance, there is a beautiful Quranic school within the depths of the medina that has some of the most incredible architecture that I’ve ever seen. The detail in the mosaics, carvings, and etchings within this old Quranic school are absolutely exquisite, it was hard to believe that they were handmade. There is also the oldest university in the world, founded in 859 AD, located within the medina. It’s only possible for Muslims to attend and visit the university as it’s located partially within a mosque, but we were able to have a peak inside to see how incredibly beautiful the architecture is. And the best part? The university was founded by a woman! 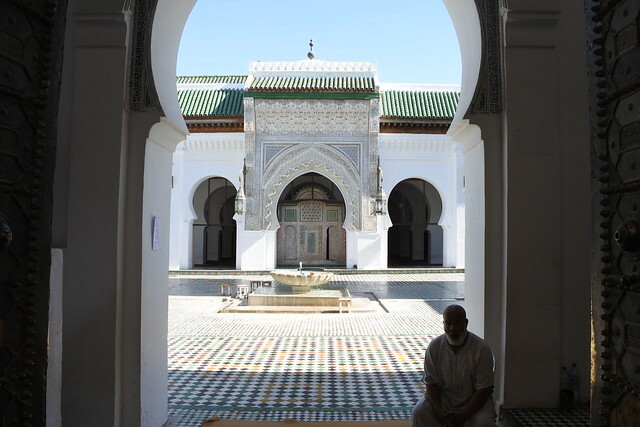 It was also interesting to see so many local people lounging in the shaded archways of the mosques in the medina, but we learned that this is a place where locals might go to escape the intense Moroccan heat and chaotic nature of the surrounding media. As such, the mosque has turned into a social gathering space in a secluded place amongst the vendors in the surrounding medina. It was great to get a peek into such an interesting part of the local culture and society seeing everyone lounging and socializing in the shade of the beautiful archways. I’ve truly enjoyed learning about the culture and history of Morocco so far, especially as a separate entity from the culture and history of Islam. In most cases, it seems as if the cultures of the country and religion go side-by-side, but the divergences have become the source for quite interesting conversations amongst our tour group, and especially with our local guides. Fes became home to many of these conversations as our local guide from Fes was so fantastic, but also because of the interesting details we learned about the country, such as the world’s oldest university being founded by a woman. 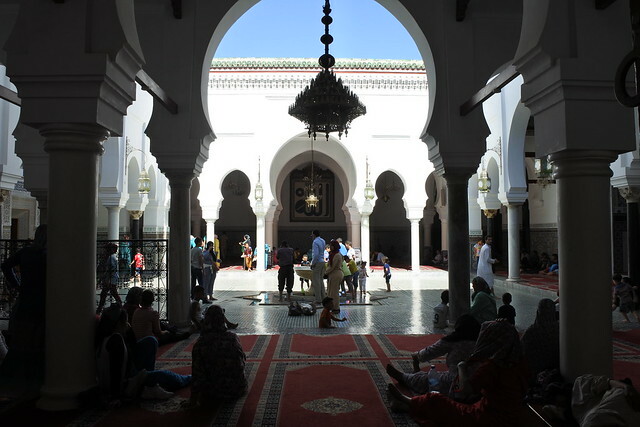 As much of the “western” world media is currently focusing on the evils of Islam and Islamic culture- something I have vehemently stood against- it was refreshing and beautiful to hear local people, both men and women, speak about their history, culture, customs, and religion in a way that reflects how proud they are of their Moroccan culture and heritage. I particularly enjoyed hearing about the development of the woman’s role in Moroccan society, as not so long ago it was forbidden for women to even leave their houses or be seen by people outside of their families. Our local guide described her struggle to find her place in the tourism industry, and her successes (clearly- she is incredible at what she does). She even joked that because there is only one key for their house, her husband was the one who had to stay home that day since she locked him in! While there is obviously a level of humor in such a statement, it shows how far women truly have come in this society, and the progress that’s being made. I’ve come to realize that no society is perfect, but it is especially damaging for us to judge another society’s values and customs using our own as a baseline. As our guide, Mohamed, explained to me, we can sit on opposite sides of a table looking a number. I might see a number 6, and he might see a number 9, but we’re still looking at the same thing; there is no “right” way of seeing any one thing, particularly when it comes to culture. I like to think that I had a good grip on combating ethnocentrism prior to my travels in Morocco, but this trip has certainly shown me that there is always room for improvement in understanding other people, and I am thankful for everything that I’ve learned so far. 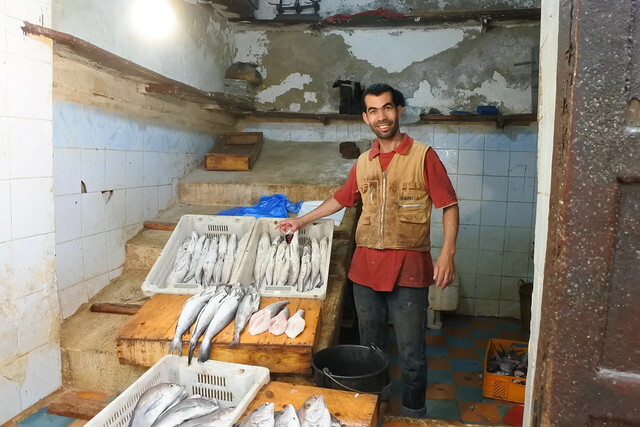 Want to keep following my Moroccan adventures? Like Study Hard Travel Smart on Facebook and Instagram, and sign up for email alerts by submitting your email address on the right side of this page!